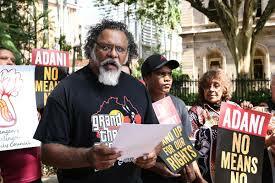 Have the Adanis finally won the battle against the traditional land owners of Australia, seeking to stall the $16 billion coalmining project in the Queensland province? The top British daily "The Guardian" reports that they have "voted in favour of allowing a coalmine to be opened by Adani in central Queensland." At the same time th report -- titled "Acrimony and legal threat as Indigenous group approves Adani mine" and a sub-head "Anti-Adani Wangan and Jagalingou Family Council says it will launch a federal court challenge over ‘sham meeting’ to endorse Carmichael mine" -- adds, "But some from the Indigenous group have labelled the vote a sham." The Adani Group is known to close to Prime Minister Narendra Modi. According to the Guardian report from Australia, "More than 300 people attended the Wangan and Jagalingou (W&J) meeting on Saturday where Adani said members 'voted overwhelmingly' to authorise an Indigenous land use agreement (ILUA) with the miners for the construction and operation of the Carmichael mine, west of Mackay." “The company has worked positively and constructively with elected leaders within W&J over several years to ensure that the company’s mine at Carmichael not only proceeds, but proceeds with the benefits of the mine being realised by traditional owners at every stage of the project,” the mining company has been quoted as saying. However, the report adds, "But there are competing interests in the W&J claim group, which acts similarly to an electorate made up of 12 families, which have complicated the company’s ability to secure an ILUA." It adds, "On Saturday an investigation by Guardian Australia revealed details of the payments and other financial dealings by Adani and its advocates in the W&J in their bid to overcome four years of resistance to the Carmichael mine." "The payments had not been not detailed to the broader W&J group, despite rules set down last year by that any 'monetary benefits' be reported and held in trust", the Guardian says, adding, "They have become a flashpoint in a dispute over who legitimately speaks for traditional owners who had repeatedly rejected the mine." While the report says the Adanis have "denied any wrongdoing", the report says, "It is understood that the seven applicants who supported Adani have been paid collectively at least $10,500, on top of travel and accommodation costs, to attend meetings with the company this year." Dishing out names, the daily says, "They are Irene White, Patrick Malone, Les Tilley, Norman Johnson Jr, Craig Dallen, Priscilla Gyemore and Gwendoline Fisher", adding, "Malone and Gallen confirmed to Guardian Australia that they had received sitting fee payments." "After the five anti-Adani applicants complained about the undisclosed payments, the seven paid by Adani reported the payments to the group’s native title lawyers, who were satisfied with the Adani formally gained the support of a majority of the 12-person W&J native title applicant group for the first time in January", the daily points out. "The anti-Adani group, Wangan and Jagalingou Family Council, has released a statement describing it as a 'sham meeting which has engineered a sham outcome'", the daily says, adding, "Spokesman Adrian Burragubba said the council would challenge 'Adani’s phoney land use deal' in the federal court." “Just last month the W&J claim group met of our own accord and said ‘no’ to Adani,” Burragubba said, adding, “We made it clear that Saturday’s meeting is not a legitimate meeting of the claim group and the resolution to approve Adani’s deal is not legitimate either.” The daily adds, "The council has also accused the Indian mining giant of bankrolling a 'bogus' land use agreement."